Fan was working as a saloon girl in a small Western settlement when Will Sonnett and Jeff Sonnett rode into town looking for Jim Sonnett (Will's son and Jeff's father.) Jim had been there a month earlier and Miss Fanny fell for him... hard. She found him to be "decent" and "gentle". I think that was her way of saying what kind of a lover he was. And Miss Fanny knew how to keep the fact that she was pregnant by him a secret once the other Sonnetts rode out of town. Fan killed a maniac named Wilk when he was about to gun down Jeff Sonnett. She ended up in jail, but the sheriff thought it unlikely that she would serve any time or that the circuit judge would even allow her to stand trial, especially since everybody in town would swear that she did no more than put down a mad dog. On their departure, Jeff Sonnett stopped into the sheriff's office to say goodbye to Fan and although she had earlier said that she really wanted to see his father once again (probably to tell him that she was pregnant), Fan decided it would be better for all concerned if Jim Sonnett focused his attentions as a "family man" on the son he already knew. She didn't want him to come back to her. Fan probably was released from jail soon after and I think she would have headed East to New York City or some other large metropolis in order to raise Jim Sonnett's child in an environment where she would have more opportunities in Life than Fan had. And yes - I think Fan would have given birth to a girl, one who would have many children of her own. And all of them would have many children who would eventually sire or give birth to Jim Sonnett's telegenetic lookalikes. O'Bviously, characters like Atar in 'Fantastic Journey' and Rael from a 'Star Trek' episode are right out of consideration! "THE CRUISE OF THE CYNTHIA B." or most of his life, a man named Reid, better known to the world as wild, wild West hero "The Lone Ranger", lived in the 19th Century. After the Civil War, he and his faithful Indian companion Tonto roamed the frontier making sure that Justice held sway and that the defenseless innocents were protected by the scourges who plagued the prairies. 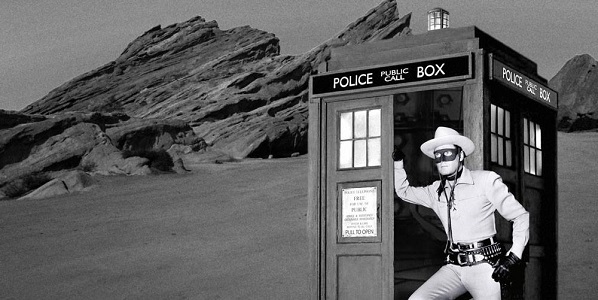 But at one point the Lone Ranger and Tonto were catapulted through Time into the Future - at some point before 1968, as a matter of fact. How did they get there in the Future of 1968? 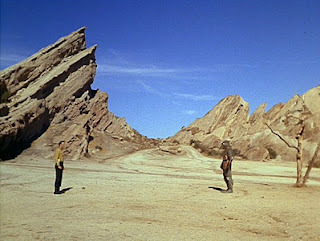 All of those iterations of the Vazquez Rocks served as touchstones for the Lone Ranger - he would journey to those formations and make camp, knowing them so intimately that he had memorized all of their defensible areas. But one of them turned out to be an illusion, a temporary "rock" formation that was in fact a TARDIS. 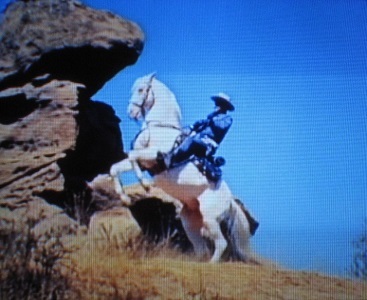 I believe it was used by the Meddling Monk and it would be just like that interfering Time Lord to trick the Lone Ranger into riding his horse up to the summit and then shooting him and Tonto forward in Time in the hopes it would change history. 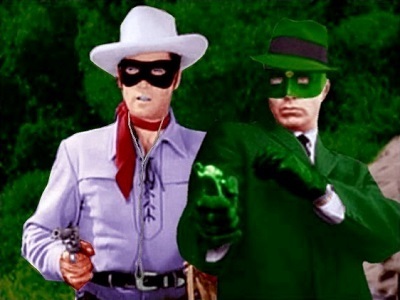 But the future excursion proved to be beneficial to the populace of the 1960s as the Lone Ranger and Tonto teamed up with not only Superman, but also the Green Hornet and Robin the Boy Wonder (who by this point in Time was flying solo), saving the country from the likes of Lex Luthor, Dr. Mabuse, and Shame. 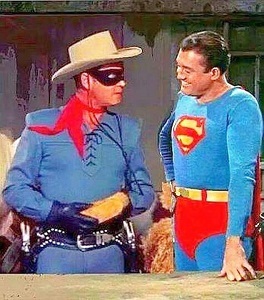 Eventually the Lone Ranger and Tonto made it back to their own Time and continued their crusade for Truth, Justice, and the American Way. So how did they get back to that point in Time? 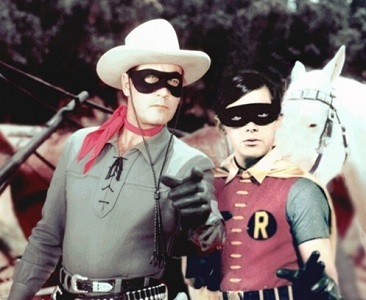 TWO FOR TUESDAY - "TATE"
For "Two for Tuesday" this week, I thought I'd share a couple of episodes of the little-known TV Western 'Tate', which starred David McLean as titular bounty hunter & gunfighter. There was a twist to the series - Tate was the first TV character with a disability to star in his own TV series. Tate is an American Western television series starring David McLean that aired on NBC from June 8 until September 14, 1960. It was created by Harry Julian Fink, who wrote most of the scripts, and produced by Perry Como's Roncom Video Films, Inc., as a summer replacement for The Perry Como Show. Richard Whorf guest starred once on the series and directed the majority of the episodes. Ida Lupino directed one segment. David McLean starred as Tate, who lost the use of his left arm during the American Civil War. Because he was injured at the Battle of Vicksburg in Mississippi, Tate's arm is covered in black leather and a glove and supported by a sling. Tate is a widower, but the cause of the death of his wife, Mary, is not specified in the series, although a gunfight seems likely. Tate had left his hometown as a teenager because of such a fight. 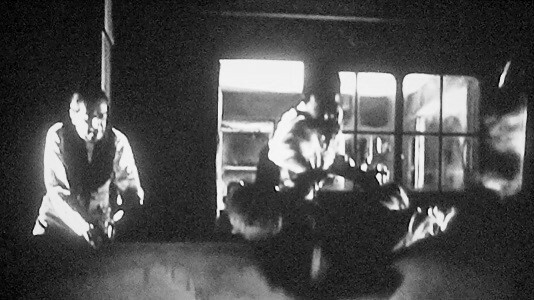 At the urging of Marshal Morty Taw, whom viewers meet in the pilot episode, "Home Town", Tate arrives to help Taw hang an old childhood friend, played by James Coburn ,who has murdered four people. Tate roams the Old West as a bounty hunter-gunfighter. 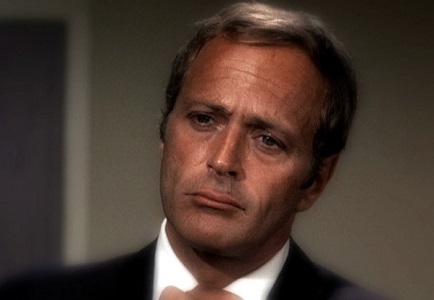 True to the nature of most hired guns on television western series, Tate was discriminating as to whom he worked for and would change sides if he found himself misled by his employers. As a gunman, he is wickedly fast on the draw. He also carries a shotgun, in his words, "to help even the odds." His reputation precedes him, and other men often seek him out in a gunfight...often to their regret. The fact that Tate is physically disabled made him the first handicapped lead character in television history and paved the way for future programs like Ironside with Raymond Burr andLongstreet, starring James Franciscus. Sponsored by Kraft Foods, Tate was a summer replacement show, filling in for the second half-hour of Perry Como's Kraft Music Hall as part of the Kraft Summer Theater. Airing after the sitcom 'Happy', with Ronnie Burns, Tate did not develop the popularity in its short run to be extended thereafter as a regular series. Robert Redford was cast in two episodes some six weeks apart: as John Torsett in "The Bounty Hunter" and as Tad Dundee in "Comanche Scalps", the latter segment withLeonard Nimoy as The Comanche and veteran character actor Lane Bradford as William Essey. Tate attempts to convince a man not to kill his brother, but is thwarted by an Indian raiding party. A widow engages Tate's services to protect her and her son from a pair of greedy land grabbers. Well.... usually I share an episode of a TV show on the weekends. But I only just found out that yesterday, August 7th, marked the 89th anniversary of Carl Switzer's birth. [He died in 1959.] This being the month in which we celebrate the TV Western, I thought we might celebrate this iconic actor's birth with one of the six episodes of 'The Roy Rogers Show' in which he appeared. Name doesn't ring any bells? Then I find your lack of pop culture awareness disturbing. I thought everybody would have recognized "Switzer" as the last name for Alfalfa of the "Our Gang"/"Little Rascals" shorts! Ordinarily, I'd say that there was a cowpoke who was poking more than cows in the area of Mineral City about a quarter century before the series began. At least a half dozen women could have fallen for his charms and eventually gave birth to his illegitimate sons. And that would have included either Dale Evans or Dale Evans' sister-in-law. Normally I would find it strange that she never noticed the facial similarity her nephew Bob had to the five other characters who came to Mineral City over those years. I might have offered the splainin that Dale was a lady, and such topics as extramarital affairs were simply not discussed... even when they involved family members. VIDEO WEEKEND - "DEATH VALLEY DAYS"